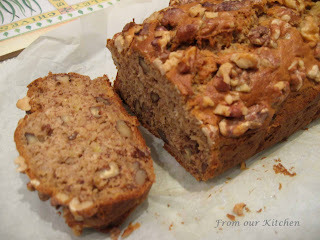 We love banana bread. It's great for breakfast, in lunchboxes and afternoon tea. It's easy to make (no mixer required), especially when the bananas are freckled with brown/black spots and sitting untouched in the fruit bowl. Preheat the oven to 175°C (120C for my oven). Take a 11cm x 22cm loaf pan and line base and 2 long sides with a sheet of baking paper, leaving 2cm overhanging. Sift flour, cinnamon, baking powder, soda and 1/2 teaspoon salt into a bowl with the brown sugar, then add the nuts. In a separate bowl, mash the bananas with a fork, then stir in the eggs, vanilla extract and cooled melted butter. Using a rubber spatula, fold the wet ingredients into the dry ingredients until they are just combined. Cool the loaf in pan 10 minutes, then turn out onto a wire rack to cool. Cut into 8-10 slices. P.S. I have also used this recipe and baked in muffin pans.